Next Post Trouble at (Vatican) mill? Hi Father—thank you for the lovely insight…I am such a fan of John Paul II—a hero, albeit a spiritual hero, to me—with lots of weaving of paths during his time as pope and even after his death…small little coincidences to a casual observer, but much more to me…. Regarding his holiness Pius XII–I’ve read two very good books about his time as pope–The Scarlet and the Black: The True Story of Monsignor Hugh O Flaherty, Hero of the Vatican Underground by JP Gallagher which provides a vivid account of the dark days of Nazi occupation in Rome and of the risk to life of the brave Monsignor O’Flarhery—always with the watchful eye of Pius in the background as he, Pius, did indeed walk a fine line…..
the other book is La Popessa by Paul I. Murphy, R. Rene Arlington which is the story of Sister Pascalina who was a german nun and the right hand woman to Pius—leaving me with somewhat conflicting feelings regarding Pius. Hi Julie – a much delayed reply, I am sorry. La Popessa is more a figure of folklore than fact much of the time. She certainly did guard and support Pius XII with great devotion; and I have no doubt she exercised much influence over him, especially in later years. But Pius XII was no fool no dupe wither, and knew well how the Vatican worked. I suspect that most popes have had trusted aides and advisors wielding greater or lesser influence than the good sister. Perhaps what secured her a place in the history books, or rather the tabloid histories, is that this advisor was a woman. It must have been sinister! If it had been a priest, he would not now be remembered, of that I am certain. 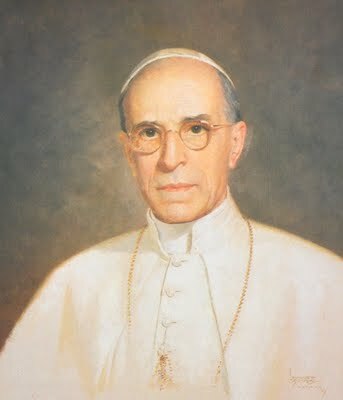 Pius XII was a magnificent pope in a most trying age: the worst war in human history and systematised national inhumanity, and then the onrush of the gales of change in their wake. He did amazingly well. God was with him, the latter’s weaknesses notwithstanding. Pray God it is untrue. It seems now that te ‘top job’ carries a ‘gong’ with it. Certainly that is the impression less informed souls might form. Not helpful in this age of papal humility, one would have thought.